This caliber is one of a series of calibers developed during the U.S. Army's SALVO program of the late 1950’s and 1960’s. The concept behind SLAVO was the development of a multiple projectile cartridge that would theoretically increase the hit probability with each round fired. During this extensive program, .22, .25, .27 and .30 cal rounds were tested in simplex, duplex and triplex loadings> Shotshell flechette and single round flechette loadings were also developed and tested. A unique feature of the non-flechette rounds is that the rear bullet had a canted base so as to build-in a random dispersion of points of impact. While the first bullet would have a normal path, the second would deviate. 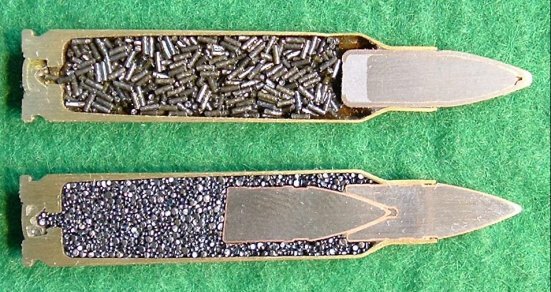 As ammunition would be loaded in a magazine in a random manner, so would the resulting dispersion patern of projectiles be random. The 6.35 x 48 (and the slightly larger 6.35 x 53) were subject to fairly extensive testing and fired along side flechette ammunition, which was also being developed at the time. Pictured here are the standard simplex and duplex loadings. Note the construction of the single ball loading- with a steel core and lead base within a GMCS jacket. This round has a knurled crimping cannelure. The headstamp is FA 59. The duplex load consists of 2 solid steel projectiles with a layer of GM plating. The headstamp is WCC 59. In the following picture are some of the variations that can be found in this caliber. Simplex Ball (FA59) with knurled crimping cannelure, indicating GMCS jacketed projectile. Simplex Ball (WCC 59) with smooth crimping cannelure, indicting solid GM plated steel projectile. Dummy with holed case and primer (WCC 59) and smooth cannelured projectile. Proof (WCC 59) with red projectile and base. Duplex (WCC 59) with orange wax over the green tip. Duplex (WCC 59) with red wax over the green tip. Wax was used on the top projectile during test firing. The first projectile would leave a coloured ring on the paper target while the second bullet would just make a hole.